Part Used & Method for Pharmaceutical Preparations: The scorpion is caught in spring or autumn and then boiled and dried in the sun. Properties & Taste: Pungent, neutral and toxic. Functions: 1. To subdue endogenous wind and stop spasms; 2. To dispel toxins; 3. To dispel wind and stop pain. 1. Convulsions due to high fever or epileptic spasms. Scorpion (Quanxie) is used with Centipede (Wugong) in the formula Zijing San. 3. Tetanus manifested as spasms of the limbs and opisthotonos. Scorpion (Quanxie) is used with Arisaema tuber (Tiannanxing) and Cicada slough (Chantui) in the formula Wuhu Zhuifeng San. 2. Facial paralysis manifested as deviation of the eye and mouth and incomplete closing of the eyelids. 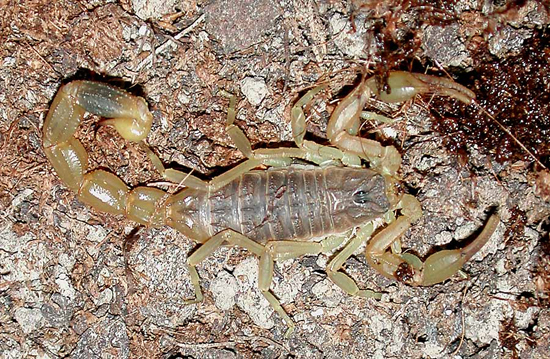 Scorpion (Quanxie) is used with Typhonium tuber (Baifuzi) and White-stiff silkworm (Baijiangcan) in the formula Qianzhen San. 4. Chronic convulsions caused by chronic diarrhea due to deficiency of the spleen manifested as spasms of the hands and feet. Scorpion (Quanxie) is used with Pilose asiabell root (Dangshen), White atractylodes (Baizhu) and Gastrodia tuber (Tianma). 5. Stubborn headache and rheumatic pain. Scorpion (Quanxie) is used with Centipede (Wugong) and White-stiff silkworm (Baijiangcan). Dosage: 2-5 g; ground into powder for swallowing, 0.6–1 g, each time. Appropriate amount for external use. Cautions & Contraindications: Scorpio is poisonous and is not to be given in large dosages. Use cautiously in patients with endogenous Wind due to Blood Deficiency.